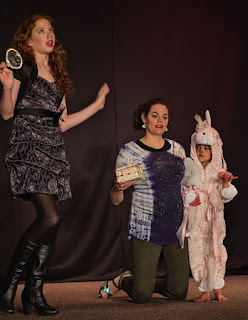 Last night was opening night. It's the end of March and for those of you who know me, that means our annual Children's Theatre musical production. 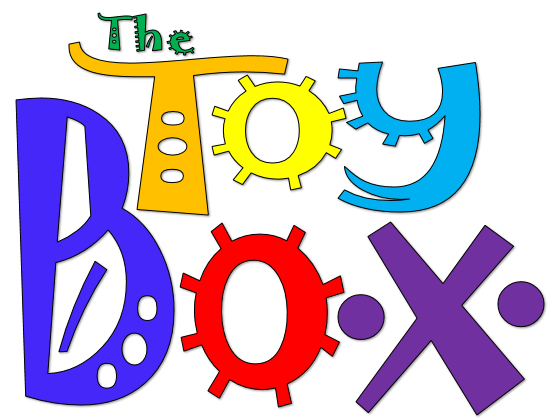 The Toy Box. Music and lyrics by Yours Truly. The story revolves around four different groups of toys in The Toy Box, a toy store. Three of the groups, the soldiers, the Barbies and the clowns are pretty much centered on themselves. The fourth group, the Stuffies just want to hug everyone. When one of the Stuffies is badly mauled by an opossum that has gotten into the store, the rest of the toys realize they have to work together as a family to convince the creature to move out. How they do it is both simple . . . and ingenious. Such a fun, fun production. And so grateful I get to do this! Me. Eyelining. This is the before. The after is me on a stool in a corner. Sans eyeliner pencil and actor. One of the uber-cute clowns. Barbies. Some doing what they do. Others getting ready to help little shredded stuffies. Please, powers-that-be, let this go on forever! 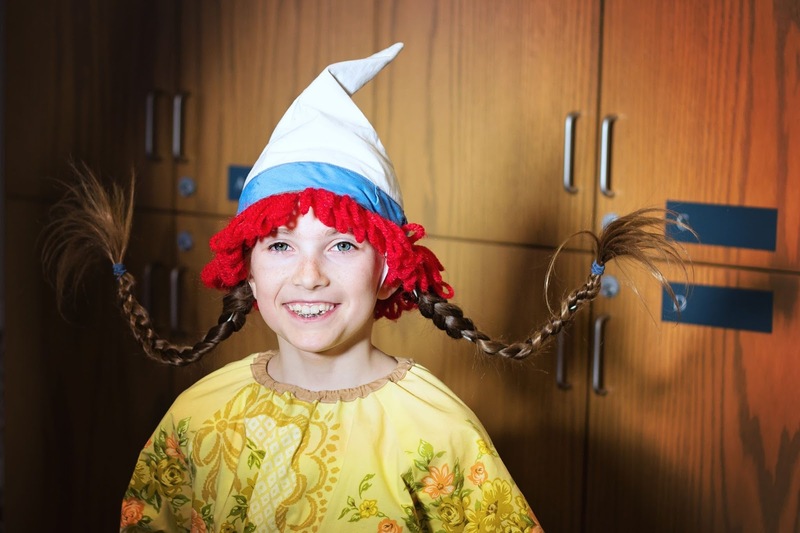 During her growing up years, Grandma Stringam was ‘happy and active and busy’. She was taught to darn, knit and embroider and also how to do all the household tasks. 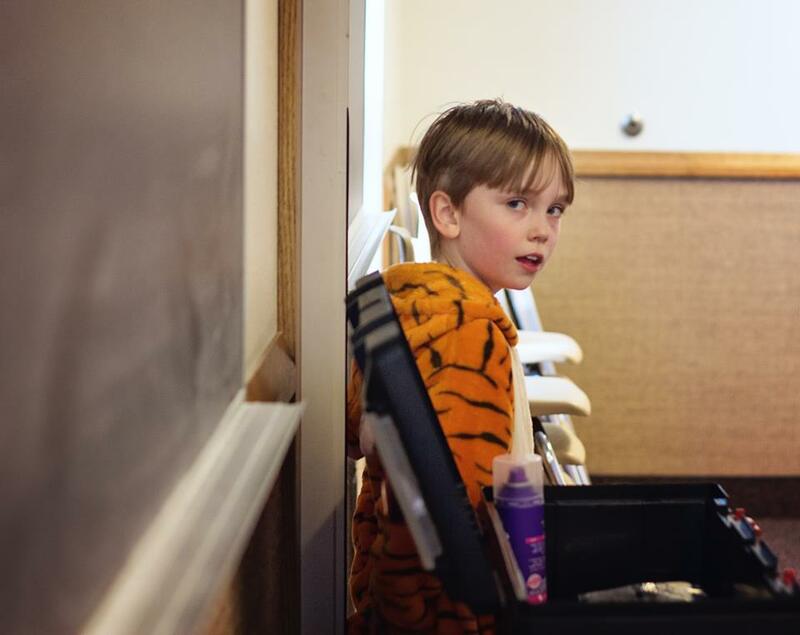 Most amusement was found out-of-doors, playing such games as Fox and Geese, Run Sheep Run, Hide and Seek, baseball and horseback riding. Once a week, they went to the school for what they called ‘Physical Culture’ when they exercised and worked with ‘Indian Clubs’. She attended a one-room schoolhouse which was heated with a large, wood-burning pot-bellied stove in the center of the room. This building was also used for church on Sunday and for ‘dances and other forms of amusement’. For the first years, she did all her writing on slates and all she needed was said slate, a slate pencil and damp sponge or rag to erase (usually attached to the frame of the slate with a string). The families all purchased their own school supplies: slates in the first two grades and then notebooks and textbooks thereafter. They had no libraries. The first teacher Grandma remembered (around 1890 or 91) was Ephrium (Ephie) Blackburn and what she recalled most was getting ready for the twice-a-year concerts at Christmas and just before the end of term. His wife played the organ and he taught the schoolchildren to sing. Their school term was shorter than the present day. About six months, from the first of October to the last of March or early April. Every Monday, after she turned twelve, she had to stay home to help her mother with the washing. Grandma asked her mother why her older sister, Jane, couldn’t take over alternate Mondays so Grandma wouldn’t have to miss so much school. Her mother told her Jane didn’t get things clean enough in the first round so when they came to her mother for the second round, she had to work too hard to get them clean. Grandma didn’t complain much after that, knowing that she was making things a little easier for her mother. She attended school until she finished the eighth grade, which was quite an achievement in those times and in that particular community. After she finished, she worked for one school year in her Uncle Charlie’s store so his daughter, who was a year younger, could take her grade eight. Labels: Still in Grandma Stringam's Journals. I know I’ve talked a lot about my Dad’s mother, Grandma Stringam. She died in 1981 at the age of 95. I was privileged, not only to know her, but to actually be able to live with her and my Aunt Emily for several months. Reading her journals has brought her even closer. But through them, I’m realizing another benefit. Glimpses of the women who were so influential in her life. 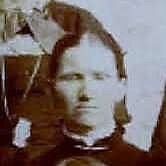 Her grandmother (My Great-Great Grandmother), Jane Smith Coleman—who was born in Dundee, Forfarshire, Scotland in 1838 and passed away in Teasdale, Utah in 1924 at the age of 86. This is what Grandma Stringam has to say about her grandmother . . .
“My Grandmother Coleman was a very busy person. She had a small greenhouse, raised chickens with a wood-burning incubator, kept a small general store, was postmistress and ran the only boarding house in the little town. 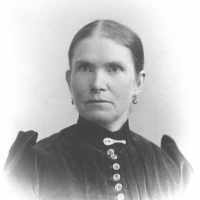 She was the president of the Stake Relief Society (a large women’s charitable organization) and taught Sunday School classes for years. There was always something that needed to be done there. Along with all the other things that went on in that household, there was also bee-keeping. 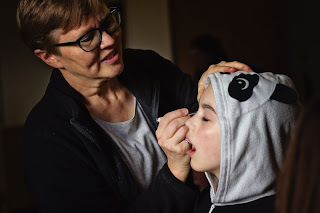 About every two weeks during the summer they extracted honey and that meant that she needed our help. Grandma would take the slats from the hives and give them to us girls and we would carry them to my mother, who was at the extractor. Mother would use a sharp knife to cut the wax that capped the honey, then she would put the slats in the extractor four at a time. When she turned the crank, the honey would fall out into the tank. We usually got about fifteen gallons every time we extracted. It was surprising how soon word of what we were doing would get around, and the children of the town would be there to eat the honey from the cappings. Another busy time at Granma’s was my Grandfather’s birthday. Every year, as long as he was Bishop (leader of the local church) she prepared and served a dinner to the whole town. Huh. I think I just figured out where I get my love of feeding people! Grandma Stringam’s journals are a treasure trove of past lives and experiences. Through them, I’m getting to know and appreciate her and the women in my family line. Another benefit is my newfound appreciation for indoor plumbing and electric everything. There’s obviously a reason I was born now. Labels: I love every one! 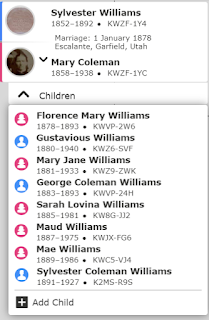 Grandma’s parents, Sylvester and Mary Coleman Williams were married in 1878 and lived in Escalante, Utah until after their first three children, Florence, Gustavus and Jane were born. Then, hearing that there was good land to be had, they moved to Teasdale, Utah about 1882 so they could take up homestead. Many of their extended family followed: both sets of grandparents as well as Great-Grandma’s Uncle and Aunt. These family members settled in or near Teasdale. Great-Grandpa’s homestead was about a mile and a half from the townsite. There, five more children were born (Grandma Stringam was number five of the eight). The first few years, the family lived the entire year in the log house they constructed on the farm, but later on Great-Grandpa Williams built a house in town and they lived there during the school months. Definitely more convenient to getting children to school. Ten years after they moved there, Great-Grandpa died of Dropsy (Edema) of the heart. Leaving Great-Grandma with eight children between the ages of 14 and one, a homestead that still had to be ‘proved up’ (Each homesteader had to live on the land, build a home, make improvements and farm for 5 years before they were eligible to "prove up") and medical bills of over $200.00 to be paid. “My mother was a very quiet woman but she was a hard worker and a good manager. When Father died, he hadn’t proved up on the homestead. But she took over with a will. Within ten years, she had proved up on the homestead, built a barn and granary and paid Father’s bills. The granary which was built is still standing and usable today (1974 when this journal was written). The neighbours she sent them to most often were her mother (my Grandma Stringam’s Grandma Coleman) or Aunt Sarah May. Aunt Sarah May had a large family of young children, so my Grandma Stringam often helped her with the washing or with the house-cleaning or putting up fruit in the summer and early fall. 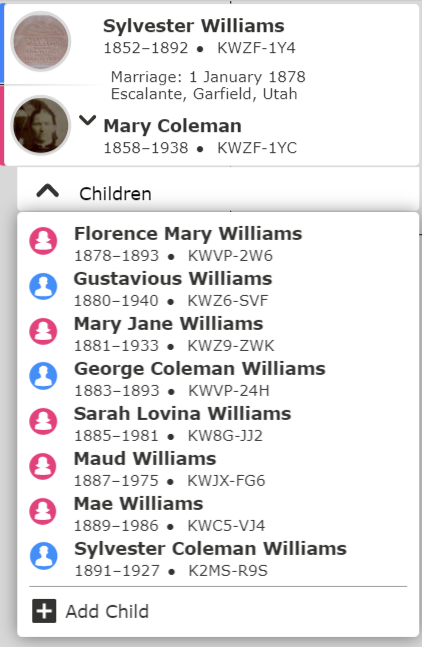 I think this world needs more women like Great-Grandma Williams. Labels: More Grandma Stringam . . .
Not smoking was a key. And left me at my friend’s. With the best of my best friends. We small-town girls were dumb. We simply watched in awe. And life outside the law. Yep. Was thinking of my folks. She looked at me, “Your folks are gone! And your house sits there bare. I sighed. I wanted so to please. Like a deer in headlights. Snared. Put on our bravest face. I felt mature and old. Weren’t due till sometime ‘hence’. S’the one for ‘Present tense’. Not one of us believed. We both were quite surprised. Then paused to be chastised. Was silenced, just like that. The words he used that day. When Daddy’s blue eyes turned to ice. Our favourite thing to see. Or do! Labels: All my Daddy was..., Poetry Monday. 1893. The year of the Typhus outbreak in Teasdale, Utah that proved so devastating to my Grandma Stringam’s family. Back to my Grandma’s journals . . .
A stark statement that packs such a wallop. Except for Jane (third eldest child) and Sylvester (youngest), everyone, Great-Grandmother Williams and six other children, were stricken. There had been a lot of flooding in their area in September, 1893 and the family dipped their water out of ditches. It was through this water they all got the disease. The two unaffected children were sent to Grandma’s house to be looked after and the rest tried to nurse each other. Living so far out, help was hard to find. And no one else wanted to expose themselves to the disease. One man, Joseph Stickney, a handyman and a ‘sort-of’ nursing orderly came by after Great-Grandma was stricken. As did a woman, Mrs. Rust, a practical nurse, who stayed until after Christmas. A third helper, cousin Gustavus Noyes, who lived 40 miles away, came to help. But he “took it and died”. The eldest sister, Florence was the first to go. She was fifteen. Florence was a very good scribe and had been told some years earlier in a prayer that she would assist her father in his work. Her father had died a year and a half before, so the family always accepted that she had been called home to do that work. Two brothers, Gus (second-eldest) and George (fourth) were gravely ill. Shortly after Florence died, Gus quit breathing. The family thought he had gone, but after a few minutes, he came around and eventually recovered. But George did not. As Gus began to breathe once more, George slipped quietly away. In all, three people died, Florence and George and cousin Gustavus. The disease clung to the household from September till March. All who recovered were left deaf in one ear, a side-effect (they were told) of the quinine they used to treat the disease. Another side-effect was their hair loss. To cover their bald heads, the family, particularly the girls, wore caps to church and school. And there, in that one statement, is Grandma Stringam’s stout philosophy of life. Times were very, very hard indeed: Losing their father, and in short order, two of the children. But they lived through it. Something I can definitely learn from. Labels: "But we lived through it"